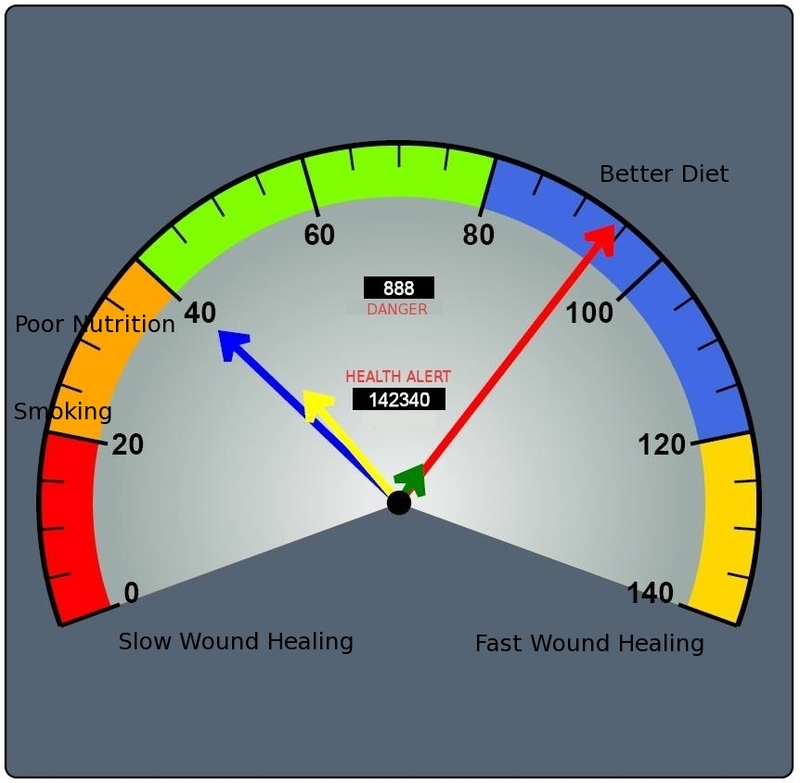 There are many variables to consider when analyzing slow healing wounds such as age, status of health, lifestyle, nutrition or post-surgery. Non-closing wounds are known as ulcers, and when located at the lower leg, feet or ankles, even walking can extend the healing process due to frequent pressure. Poor blood flow to the wound can also prevent sores from healing quickly and could be a signal of diabetes or another chronic disease. If a patient is a smoker this also slows down the healing process, since smoking keeps damaged cells in an inflammatory state, while being deprived of much needed oxygen. Natural wound healing involves several steps. Right after an injury, the body increases blood flow to the trauma area. This is when a wound becomes red and warm, while allowing white blood cells and platelets to get to the spot. Platelets activate blood clotting or coagulation and prevent further bleeding. At the same time, phagocytes, called scavenger cells remove damaged or dead cells. Oxygen and other nutrients produce new skin, including new blood vessels. Connective tissue fibers or collagen are developed, and then small muscle cells are produced. At this stage the edges begin joining together so the wound can close. Barriers to wound healing include diet and poor nutrition. According to Wound Care Centers and Health News.org, protein is the most important part of your diet when trying to promote wound healing. Energy, or calories from carbohydrates and fats, amino acids, antioxidants and minerals – especially zinc are also important. Protein helps repair the damaged tissue from your wound and adding more protein than usual to the diet has been proven to help the healing process. This means two to three servings of protein a day with each meal containing at least two to three ounces of meat. One cup of beans or two tablespoons of peanut butter are alternatives (but not too much peanut butter if weight is a problem because of the fat). On the other hand, when not enough daily calories are consumed, the body may convert more of the protein ingested to energy instead of healing. In addition to lifestyle changes, The Woundcare Clinic of Savannah offers advanced therapies to help speed the healing process. We recommend you consult your physician for specific nutritional recommendations based on your condition(s). If you live in the Savannah or Hilton Head area and have any questions about your wound care management, please contact us.